A ‘Train the Trainer’ Course—on Steroids! This course fulfills the requirements to become a clock-hour approved instructor in Washington state. It has the same curriculum as my 'live' course, Instructor Development Workshop.. I've created this document to help you get the answers to your questions concerning various courses, instructor approval, time frames, how to find courses, etc. Click here to get it. About this resource: The handbook and other documents are digital. After you order the program, you will receive instructions at the bottom of your order confirmation on how to download this resource. Be sure to download right away. Your pass code will expire in 14 days. Don’t just take a course to qualify as an approved instructor in Washington state—get the dozens of skills, along with ready-to-use forms and examples—you need to create training programs, outlines, and presentations—even resources for creating a training program. This is the resource you need to propel your office past the challenges of the market and into profitability. Note: You have 6 months from your date of purchase to finish the course. After that, renewal rates apply. Written by National Realtor Educator of the Year, Washington Realtor Educator of the Year and former master CRB instructor Carla Cross, this course material has been chosen as ‘best of its’ kind, and recommended by the Council of Real Estate Brokerage Managers. I really enjoyed the organization of the information and the templates for creating workshops on my own. I learned a great deal about different learning styles and ways to enhance retention. I think the resources in the back will be invaluable when preparing to write and submit a course for approval. Albie Moshcatel, Manager, John L. Scott, Renton, Wa. • A 140+-page hard copy handbook: Train the Trainer, valuable long-term resource for you as you create your course materials, arrange training events, and even promote them (Carla provides you many strategies she learned as Vice-President for Career Development for Windermere Real Estate, as a writer for courses of some of the largest international franchises, and course writer for CRB). 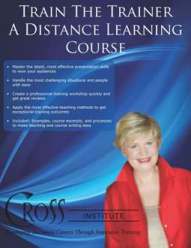 • A 5-Disc CD audio set with Carla personally teaching you innovative teaching concepts and skills. One of the CDs features National Realtor Educators of the Year Carla Cross and Bonnie Sparks, as they demonstrate creative training methods during a National Association of Realtors National Convention presentation. Both Carla and Bonnie were senior CRB (Certified Real Estate Broker designation courses) instructors for several years. They had to meet the 'master training requirements credentials' as they taught CRB courses nationally. This is a well written program that I enjoyed taking. This training just completed will be timely for me in our development of learning objectives, and module “methods of delivery” and will add value to our program development at consortiumcollege.com and its work. I want to thank you for the excellent seminar. I have been a trainer for a large portion of my business career and it is somewhat disconcerting when I find out that I could have been more effective if I had known the principles and guidelines presented in this home based seminar. The seminar provided information that I will refer to throughout the balance of my career. I enjoyed, not only the information, but also the well thought out process as well. Carolyn Mackay, Real Estate 2000 Corp., WA. Thank you for the wonderful training in Houston last week. Everyone had a mind-altering experience about how to approach being “real” trainers—you are wonderful to have so effectively lead such a strong-willed group of people. I have had the pleasure of working with Carla for several years. During that entire time Carla has been creative, progressive and thorough. She has also been an outstanding source of ideas. Most important however, is that she understands the “wants and desires” of agents while having the ability to assist agents in confronting their “needs”. For many agents, facing reality can often be a problem. Carla is also consumer centric in her approach to the business. As our business evolves and the market tightens those agents that have the best interests of their clients at heart will be the ones that succeed. Undeniably, Carla has the ability to view our business from a perspective that many others cannot. Carla is truly a leader. I always look forward to the next time that we meet and discuss how simple and complicated our business can be.